Well, tomorrow is the big day … the hanging and opening of our Descanso Gardens group show … and this is one of the big paintings I’m taking. 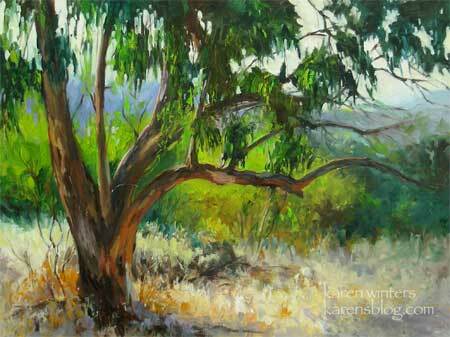 It’s a portrait of one of my favorite California trees, the eucalyptus. The moment I saw this beauty I was compelled to paint it in all its backlit glory. The show runs from August 22 to September 18 and the gallery is open from 10 to 3:30 but might close some days at 3. On the days I’m gallery-sitting I will probably bring something with me to paint as I did last year. Our reception will be August 31, Sunday of Labor Day Weekend, from 1-4. If you live in Southern California, I hope you’ll have a chance to drop by. I won’t be there every day, so send me a note if you’re planning a visit so I don’t miss you. I haven’t visited lately but you are producing lovely work. This picture could be of a place in Australia. You really have got theright look of a gum tree. I’m in fiji at present with the grandchildren so it’s quite a different lifestyle and I have to share my colours with four kids! I haven’t visited lately either — it looks like you’ve AGAIN put together a beautiful show. I know it will be a success! C’est beau! It’s beautiful! We have eucalyptus too in the south of France, I love these beautiful trees, and they smell so good. Your painting is gorgeous! Love the reflected light on the bottom of the limbs–this is gorgeous. Your work is lovely – Lush is the word that comes to mind. You are masterful at capturing those landscapes. many ways you have used lighting here, and the misty hills. lovely! your light it so perfect in this tree portrait. I’d love to be a tree and have you do my portrait. The show is beautiful..I enjoyed getting to meet you in person! I will treasure my cards – as soon as we get back home, I am going to find frames and put them up on the wall as a memory of my lovely day at Descanso Gardens. I came across your work looking for trees to study. I love your work. We lived in Flintridge for many years, then moved to Laguna and now in texas..so I can easily follow your time travels with great enjoyment. My husbands mother was one on f the original ‘helpers’ at Descansos so we have many connections.. Thank you for your beautiful work…it is a treat.